What’s a few drinks with co-workers or friends while you’re networking or enjoying a party? In the moment, nothing but casual fun (and maybe some extra liquid courage), but if this is your weekly routine the affects may hang around longer than your buzz. 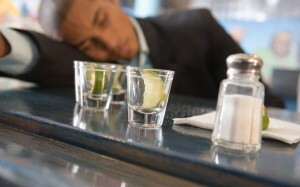 At some point, the drinks will catch up to you and your liver and take a serious toll on your health. Looking into your eyes isn’t the only way to tell if it’s time to give your liver a break. Here are more physical symptoms to look out for. I’m not just talking about the day after hangover. Consuming alcohol affects your body’s absorption of B12, an essential nutrient. This can cause fatigue and even make you light-headed in some cases. Alcohol is seriously dehydrating and if there’s one thing your hair and nails need to stay healthy it’s proper hydration. Drinking alcohol regularly can make your hair dry and brittle, and possibly lead to hair loss. You may not drink beer, but you can still get what looks like a beer belly! Alcohol is full of empty calories that tend to collect around your middle. You might not remember much after a “sunglasses and Advil” night of drinking, but heavy drinking over time can lead to memory loss issues. Wernicke-Korsakoff’s Syndrome is a dementia-like illness that is caused by a lack of vitamin B1. If you notice yourself feeling more moody – anxious, irritable or nervous – you may be able to blame it on the alcohol. Even drinking small amounts of alcohol can amplify your emotions. Also, alcohol depletes natural chemicals in the brain that are necessary for keeping your mood positive and reducing anxiety. Could traditional black family ideals be promoting obesity?